Like you said “A day late and a dollar short” ! too bad for them. And we learned the hard way etsy didn’t care until more and more got involved. I commend all of you vendors for pulling out and sticking to your principles. Also thumbs up for everyone else that spread the word and made a difference. 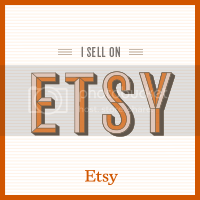 Way to go, give it to ’em sister!…it really is a shame about Etsy as I did love some of the vendors, but I can’t shop on a place that has no respect for it’s fellow man! It really is a shame as I liked it there. But I cannot make even a penny for a place like that.